Once you've created your account, you're now able to make your own Voki. With your Voki, you can customize its appearance, give it a background, and even give it a voice of its own. Visit at www.voki.com. Before making a Voki, you have to create an account. If you haven't already done so, click on Creating an Account for an article that will give you step-by-step guidelines on how to create your account. Step 1:Log in at http://www.voki.com and click on the Create tab. Step 2: Under the Customize Your Character tab, click on the Head icon. Step 3: Choose the type of character you want by using the side arrows to navigate through character types. Step 4:Customize your character's features however you'd like, by adding facial features, clothing, and bling. Step 5: Give your Voki a voice by calling the provided number ((631) 517-5736), typing in text, or by using your computer's microphone. 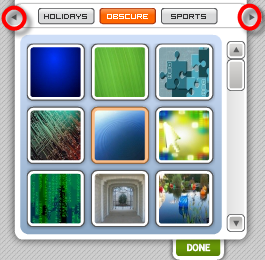 Step 6: Select the Backgrounds icon. Step 7: Choose the type of background you'd like by using the designated navigation arrows. Step 8: Click Done when you've selected your background. 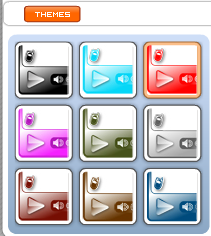 Step 9: Click on the Players icon to select a theme for your Voki. Step 10: Select a theme. Step 11:Click Done after you've selected your theme. Step 12:Click the Publish button. Step 13: Name your scene. Step 14: Save your scene. Congratulations, you have successfully created your Voki.